Having a “Pretzel Day” all year long. 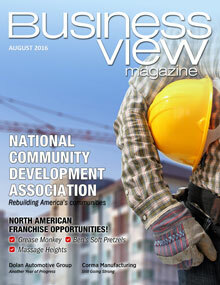 Business View Magazine profiles Ben’s Soft Pretzels, franchiser of soft pretzel outlets, with headquarters in Elkhart, Indiana. The pretzel is a very old and very prized food. Legend has it that pretzels were invented around 610 A.D., by Italian (some say German, some say French) monks, as a reward for children who had learned their prayers. Pretzels originally came to the United States in the late 18th century, brought in by Southern German and Swiss German immigrants, better known as the Pennsylvania Dutch. Today, traditional baking techniques from centuries past are still be practiced by culinary artists devoted to this singular and tasty edible. One such practitioner is Ben Miller, a third-generation Amish baker, who, along with his wife, Elizabeth, bought a small, soft pretzel business some years ago in South Bend, Indiana. Unfortunately for Ben, but providentially for the business that was later to become Ben’s Soft Pretzels, the recipe for the provender he hoped to sell didn’t come along with the shop. So, the couple went to work, improvising and experimenting until they came up with the recipe that was destined to transform their lives and the pretzel business as a whole. Enter business partners Scott Jones and Brian Krider, who met Ben one day and, after sampling some of his wares, decided to start a business built around the Miller’s proprietary recipe for soft pretzels. 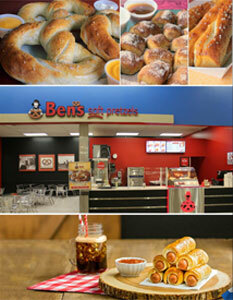 The partners opened their first Ben’s Soft Pretzels store in Elkhart, Indiana in May 2008. Within 18 months, they opened store number two, and six months later, store number three. In March 2013, Jones and Krider sold their first franchise and by 2015, the company had nine corporate stores and over 30 franchise locations in Indiana, Illinois, Michigan, Wisconsin, and Florida. Bob Thatcher is the company’s new Director of Franchising and Real Estate Development, having come to Ben’s Soft Pretzels with 25 years in the commercial real estate business with a focus on enclosed, regional shopping centers. He’s very bullish on Ben’s expansion into new markets, as well as the company’s willingness to commit capital and talent into an ever-expanding territorial footprint. Check out this handpicked feature on the Platinum Storage Group.